Day 95 – TP spent Easter Sunday dressed as Captain America. Day 96 – We took an Easter Monday woodland walk. Day 97 – We spent the day in the garden, I think this photo of JR sums up the day. 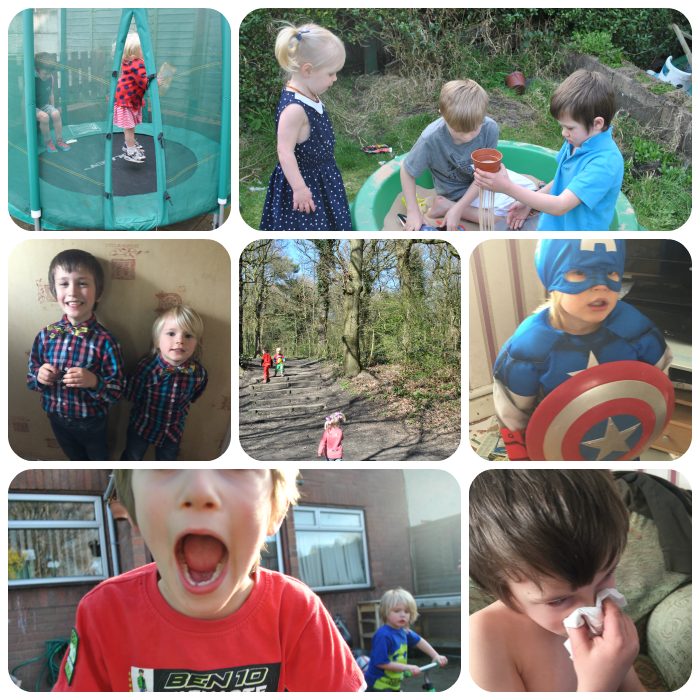 Day 98 – The tiny 3 played in their grandparents garden with their cousins who were visiting from Essex. Day 99 – As a sign that the weather is getting warmer, JR had a nosebleed. Day 100 – The Tiny 3 spent the whole day enjoying playing on the trampoline. Day 101 – The boys looked so smart dressed ready our cousins wedding. We have a Captain America fan here too! Bravo on all that lovely outdoor time and I am sure they were stars at the wedding in those super outfits. What a lovely roundup of your week! great to see all the t-shirts and Summer dresses being worn, but what a shame about the nose bleeds. Woodland walks are such fun with so much to look at and find.